Despite being right next to the main Kings Canyon National Park entrance on Highway 180, most people drive past the giant sequoia of Big Stump Basin without stopping, eager to see the more famous trees at the General Grant Grove, 3 miles further down the road. 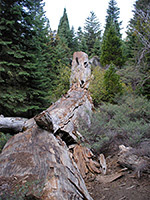 So the trail through the basin is less crowded, and has a greater variety of things to see, including old growth sequoia, grassy meadows, wildflowers, and in particular many huge stumps resulting from logging of the original forest in the late nineteenth century. Traffic noise from the highway is audible in some places but most of the woods are quiet and peaceful. The loop trail is 2 miles long, looses then gains about 200 feet in elevation, and takes less than an hour to complete. 8 views of the Big Stump Trail. The path to the basin crosses the highway half a mile inside the national park boundary, next to what used to be the entrance booth, though this was closed a few years ago since right next to the road stands an old, damaged sequoia that became unstable and was thought likely to topple over onto the buildings. Now both the entrance station and the start point for the hike are a half mile further, at a parking area on the west side of the road. 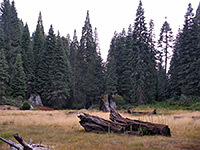 The beginning of the path is marked by an information board and map; the trail leads down a hillside into the forest, past one very large sequoia and out into a wide, circular meadow dotted by many weathered stumps and logs, which provide quite a contrast to the green forest and lush grassland all around. The dry, dark, dead stumps seem quite out of place in this otherwise healthy landscape, as if placed here artificially. In the 1880s the meadow housed the Smith Comstock Lumber Mill, an operation which split the timber into fence posts and stakes to be used for vineyards and farms in the Central Valley. 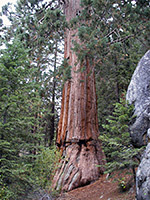 One well known stump is of the Mark Twain Tree, a 1,350 year old sequoia that was felled in 1891 after a team of two men spent 13 days sawing it. Now the top is reached by a short ladder, allowing for a close up look at the growth ring patterns. Another named feature is 'Feather Bed', the name given to a trench that was dug beneath a tree about to be cut, then filled with thin branches in order to cushion the fall, since sequoia wood is quite brittle and liable to shatter on impact. The one remaining trench is now overgrown with grass and bushes. The trail meets the main road and continues up the hill on the far side, climbing a little through more open, uniform forest without any meadows though still with scattered stumps, occasional surviving old sequoia and many newer specimens. A short side path leads further uphill to the Sawed Tree, a tall sequoia that bears the scars of deep cuts from a band saw made over a century ago, though now the tree is perfectly healthy. After this junction the woodland becomes just a bit more overgrown as the trail descends back to the highway, joining it right opposite the carpark.